Illustrated book plate, signed by the author. This book plate is the size of the book and very atractive. Exclusively for The Overlook Connection. Overview:In the most ambitious and exciting X-Files adventure to date, Mulder and Scully fly to the Yucatan jungle to investigate a missing team of archaelogists. Their exploration leads to a strange electronic signal coming from beneath ancient ruins -- a signal aimed upward, at the stars. Harper Prism 1996. First Edition. 6 X 9. Hard Cover. Signed Plate By Author. Fine / Fine unread copy. 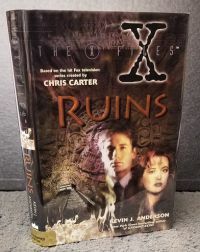 A novel based on the television series , The X-Files. Sealed.